In scientific terms, Jade is the name shared by two distinctly different minerals – Nephrite, a calcium magnesium silicate, and Jadeite, a sodium aluminum silicate. Though they have different compositions, hardnesses, densities and crystal structures, both are exceptionally tough stones, similar in appearance, and equally valuable in metaphysical properties. Both occur in the beautiful olive shades we’ve come to recognize as jade green, but have some distinctions. For metaphysical purposes discussed in this article, and related pages, Nephrite and Jadeite will both be referred to as Jade. 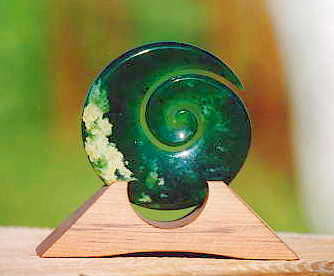 This page will deal primarily with the overall properties of Jade, and attributes specific to Green Jade. Other colors have additional properties and may be discussed on a separate page. Click the links below for complete listings of those Jades. Black Jade emanates strong, protective energies to ward off negative assault, physical or psychological, including self limitation. Brown Jade is grounding. It connects to the earth and provides comfort and reliability. Lavender Jade alleviates emotional hurt and provides spiritual nourishment. Its energy is of the highest etheric spectrum. Orange Jade brings joy and teaches the interconnectedness of all beings. It is energetic and quietly stimulating. Purple Jade encourages mirth and happiness, and purifies one’s aura. It dispels the negative and increases one’s level of discernment. Red Jade is a stone of life-force energy, dispelling fear that holds one back, and urges one to action. White Jade filters distractions, pulls in relevant, constructive information and aids in decision making. Yellow Jade is cheerful and energetic, a stone of assimilation and discrimination.